Updating the January Barometer, distinguished from the JanuaryEffect thatcompares small capstock performancetolargecaps, the January Barometer uses the DJ Industrial Average or the S&P 500 Index.Accordingto the Stock Trader’s Almanac January’s S&P 500 Index close, up or down determines the likely direction ofthe for the year. Adding last year’s down close to the record puts another “Wrong ” inthe result column. Here is the record since 2008. 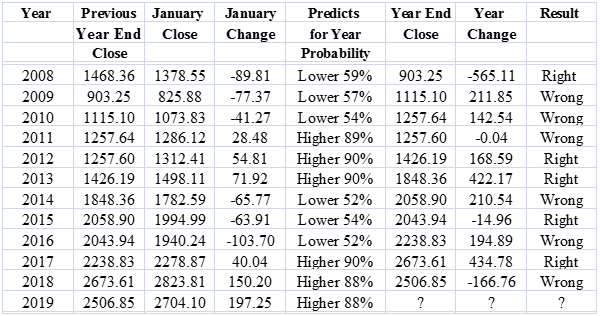 While this indicator produces mixed results for the years when January closes lower, the record for predicting higher closes for the years when January closes higher is 88% going back to 1950, based data from the Stock Trader’s Almanac. Since 2008, this indicator has been “Wrong” six out of eleven years, not very good odds. However, Tom McClellan says the January Barometer has correctly predicted the correct results for the DJ Industrial Average 75% of the time since 1928, and 64% of the time since 2000. S&P 500 Index (SPX) 2706.53 gained 41.77 more points or +1.57% last week, including breaking out from a small symmetrical triangle consolidation pattern Thursday, confirmed by increased volume of 3.3 billion combined shares. Now well above the 50-day Moving Average at 2609.06 and the operative downward sloping trendline from the October 3 high at 2939.80 that didn't slow the advance. The next resistance will be at the 200-day Moving average now 2741.47. Several analysts continue anticipating an attempt to retest the December low since that has been the pattern after all the significant declines after 2009. Even the V bottom that started in March 2009 finally pulled back somewhat in early July 2009. 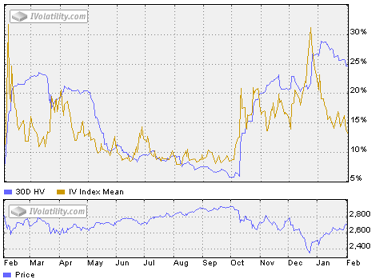 CBOE Volatility Index® (VIX) 16.14 declined 1.28 points or -7.35% last week. Our similar IVolatility Implied Volatility Index Mean, IVXM using four at-the-money options for each expiration period along with our proprietary technique that includes the delta and vega of each option, declined 1.17 points or -8.12% ending at 13.24, just below the bottom of the recent range shown in the one-year volatility chart with an SPX line chart below. 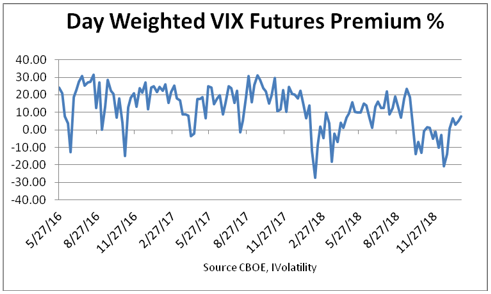 With 7 trading days until February expiration , the day-weighted premium between February and March allocated 35% to February and 65% to March for a 7.54% premium vs. 5.17 % the prior week ending January 25. Sill below the bottom of the green zone between 10% to 20%, it continues suggesting cautionary positioning unconvinced the SPX advance will continue without an attempt to retest the December lows. Early last week as a small symmetrical triangle continuation pattern began forming that ended the potential bearish Rising Wedge pattern underway since the December bottom. Market Breadth as measured by our preferred gauge, the NYSE ratio adjusted Summation Index that considers the number of issues traded, and reported by McClellan Financial Publications, continued higher gaining another 341.41 points or 103.83% for the week ending at 670.23, well above the important 500 level that supports bullish forecasts. Last week in Digest Issue 4 "Top ETFs [Charts]" it looked as if breadth strength would continue improving enough for the S&P 500 Index to soon close back above the operative downward sloping trendline and it did last Wednesday. Here is another bullish Foremost Indicator. iShares iBoxx $ High Yield Corporate Bond ETF (HYG) 84.68 +.66 or +.78% for the week and up from its December 26 intraday low of 79.19 or +6.93%. These are the BB bonds used for M&A activity that trade like equities with a bond market liquidity component. Interestingly, on the way down from the October high several potential bullish patterns failed and now on the way back up a potential bearish Rising Wedge pattern also failed. The ballyhooed January Barometer that attempts for forecast the year-end close of the DJ Industrials and the S&P 500 Index fails to provide much useful information for trade planning although the long-term record suggests some validity. Last Wednesday the Federal Reserve announced they have disengaged the autopilot for the balance sheet run-off and equities responded by breaking out from a small symmetrical triangle continuation pattern thereby ending a potential bearish Rising Wedge while market breadth continued improving enough to reverse the previous bear market call. Next week will feature a review of our Advanced Options data service along with a brief market review.